Add Traction for Your Gloss Sealers - Reduces Slipperiness! What is the necessary drying time between coats when adding Super Grip to second coat? 1-2 hours. Just make sealer is dry to the touch. I have sealed driveway 2 in 4 yrs. but you would never know it. I cleaned it and ready to. Seal. 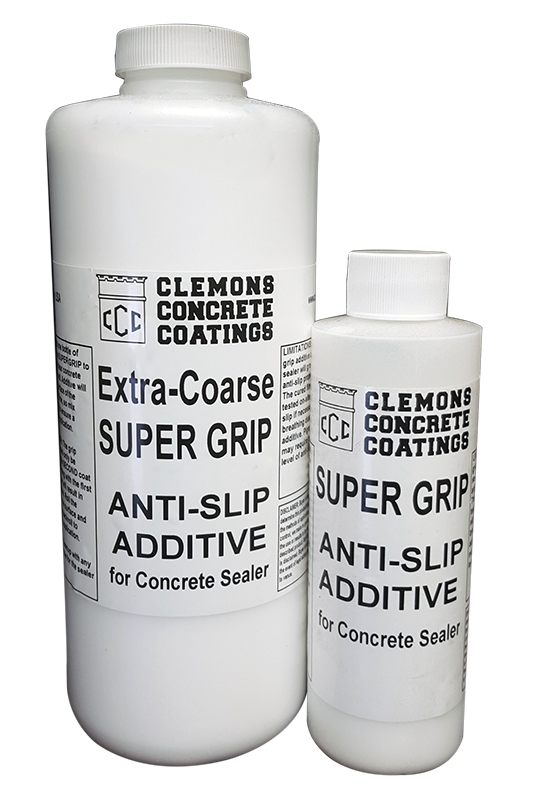 Some question about using super grip if never sealed before! Can I use it or should I not since there is no sign of old sealer on driveway. You will need two coats and the Super Grip added to the second coat. Is one per 5 gallon the right mixture? Above it says " The additive mixes in with one 5 gallon pail". I just received a bottle of the super grip and on the bottle it says to mix one bottle with 1 gal. So wich is it? 1 bottle to 5 gal or 1 bottle to 1 gallon? John, it may dull it a little but not that much. Does the SuperGrip reduce gloss in Superseal 30? I could not locate/find a data sheet on the SuperGrip. The data sheet for a similar product: HC Sharkgrip sold by Sherwin Williams indicates it's use reduces gloss.